This blog is a hard one to write. I truly can’t believe I had that much to say, to share, to enjoy with each of you. I have needed to make the very difficult decision to stop writing the blog for several reasons. The main reason being the amount of time that I dedicate to it. I spent a lot of time each week researching, writing and thinking about this blog. I enjoyed every minute of it but sadly, it is not a source of income for me (or anyone that I know). Money was not a huge factor until my husbands workplace burned down 6 weeks ago. We are now very strapped for money, finding it difficult to afford even the necessities and while I know that we are still more fortunate than most of the worlds population, something needs to be done. My husband is looking at leaving the island and getting work somewhere else for at least a few months to help get us on track again and that is obviously a huge move. I also need to focus on earning some money so the burden does not sit on his shoulders alone. Thankfully I can sell my artwork but I need to devote a lot more time and energy to that. Send me a little message so I know who you are okay? If you’d like to keep in touch via email, please contact me by using this contact form. To anyone that is disappointing with this decision, I am truly sorry. I have never been a person who feels that money is more important than everything else but when you are at risk of losing your home, things must change drastically. I hope that you will take a moment to sign up to get emails about my artwork and perhaps even share it with friends. I could really use the little extra boost in traffic. I want to wish each and every one of you all the very best from the bottom of my heart. Thank you for coming along on my journey for the past 2 years. I’ve learned a lot, appreciated the support, and felt good about being able to share what I was so lucky to have a chance to learn. My intention from the beginning was to take what I learned in hospital and to “pay it forward”. I feel like I have done that and I am proud of that accomplishment. Now it is time to take all the kindness, compassion, and care I have received through each of you in here and pay that forward in a new way. “The effects of childhood sexual and physical abuse lasts a lifetime” – Scott Mendelson MD – Huffington Post. The effects of childhood sexual and physical abuse last a lifetime. Abused children may grow up to be adults prone to depression, anxiety, substance abuse, and other psychiatric disorders. They are more prone to suicide. However, in recent years we have learned that abuse does more than wound self-esteem and break the spirit. It can damage the very substance of the brain and how it functions. A major way by which childhood abuse can disrupt normal brain activity is by diminishing its capacity to handle stress. Stress is more than the worry and distress we experience when the circumstances of life push us beyond our limits. The body’s response to stress is a complex biological mechanism. When the brain senses that the body is being taxed beyond its usual capacity, it initiates the stress response by releasing a substance called corticotrophin releasing hormone, or CRH. CRH stimulates the pituitary gland to release ACTH that, in turn, triggers the release of the stress hormone, cortisol, from the adrenal glands. Cortisol marshals the body’s resources to provide the extra energy and endurance to meet the demands being placed upon it. Once, this might have been escaping an angry mastodon. Today, it would more likely be getting used to a new job, a nasty divorce, or recovering from surgery. A study published in 2009 in the prestigious journal Nature Neuroscience revealed part of the reason why adults who were abused as children have abnormal stress responses. The grim details of the study included comparisons of the brains of individuals who had committed suicide vs. those who had died natural deaths. Among those who had committed suicide were some who had suffered severe childhood abuse and others who had not. It was found that among those who had suffered abuse, there were fewer of the special cortisol receptors in the brain that allow cortisol to turn off the stress response. It was further found that the section of DNA responsible for maintaining adequate numbers of these receptors had been methylated. They were no longer in full operation. When the stress response won’t shut off and cortisol levels remain high in the brain, bad things can happen. Whereas bursts of cortisol help bolster the brain’s supply of glucose and chemical messengers, sustained high levels of cortisol can cause damage. Cortisol diminishes the brain’s response to the chemical messenger, serotonin, while it enhances the response to norepinephrine. Persisting high levels of cortisol also decrease levels of Brain-derived Neurotrophic factor, a substance that is necessary to maintain and replenish neurons in the brain. These and other changes alter mood, disturb sleep, heighten anxiety, and cause irritability. Consequently, the individual becomes more prone to Major Depression, PTSD, Generalized Anxiety, and other psychiatric disorders. This explains why people with PTSD, cannot cope with the same amount of (brain) stress, as people without PTSD. ‘Brain Stress’ is anything the brain has to do for us to function. This will include all we do unconsciously, like our internal organs working, breathing, moving, food digestion etc. It also includes good and bad stress we deal with daily. Good stress, being anything the brain processes not causing negative emotions – eg taking a shower. Bad stress being anything that does cause negative emotions, like naughty children, noise (big PTSD stressors). This shows the daily good stress, everyone’s brains deal with daily. This shows the added bad stress, everyone deals with daily. As you can see, there is still room left for added good or bad stress, before the cup ‘overflows’. The cup ‘overflowing’ – will be when the person can’t cope emotionally and becomes irritable, angry, tearful etc. 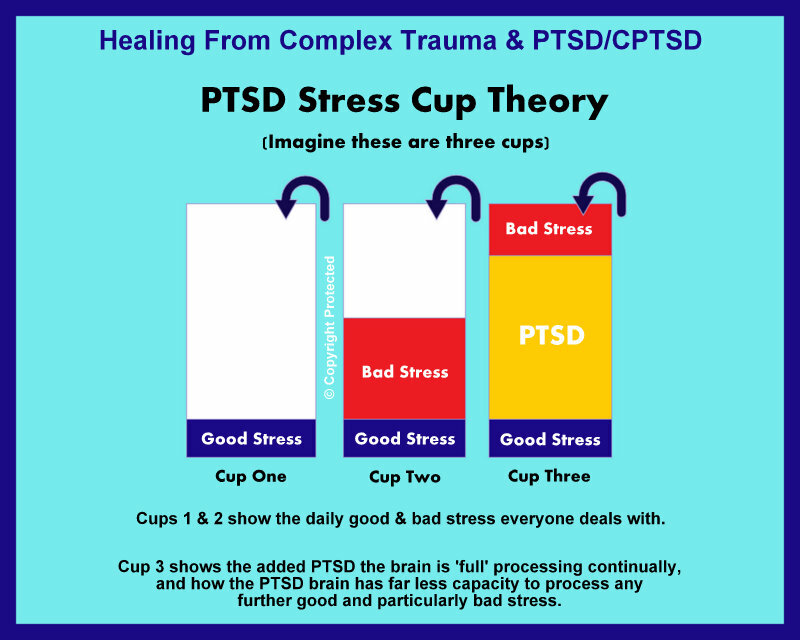 This shows the added PTSD brain ‘stress’ – a PTSD brain is dealing with – added to all the normal good and bad stress everyone has. There is very little room left for any added good or bad stress, to occur. Which is why people with PTSD don’t cope well, with added stress and can get very irritable, fast and quickly over minor things. This is described a being when the ‘cup overflows’. In order to reduce this overflowing, no stress can be occurring, so the ‘cup empties’ a little, back to having room for daily stress again. I know when my cup is overflowing, as I start to become irritable, and I know my coping capacity, reduces, quickly and stressors like noise, irritate me more than normal. I have learned to reduce my daily activities, have relaxing time, and not plan too many things in one day. I have learned to have relaxation time before anything anxiety/stress raising, and have relax time afterwards. Along with all the breathing, mindfulness strategies, this is how I have learned to manage my ‘cup overflowing’. I have to do this, because if my ‘cup overflows’ continually, my mood lowers, my emotions increase and all my complex PTSD symptoms then increase as a result, which results in complete incapacity, to cope and can become life threatening. PTSD – is a life threatening disorder, when severe. It is why I always say, you will not learn to manage your PTSD well, if you have a busy, stressful daily life. Which cannot always be avoided, I understand, but it is essential for PTSD management, to have the least stressful life possible. Especially if the PTSD symptoms are severe, and while first learning to manage them. This is a tough evening for me. “Mother’s Day Eve”. Sadly, I know I am not alone so I wanted to send out an article written for Psychology Today that just might help. My heart goes out to each of you who feel this pain and absolutely breaks to know so many have suffered. I also want to mention ALL mothers. Perhaps you are a Mother yourself. You might have been a Mother but lost your child. Sadly there are also many who strive to become Mothers and just can’t. Then there are those who choose not to become Mothers for all the right reasons. Kudos to you too! And to Mothers who gave the biggest gift to a loving family through adoption or surrogacy. Then there are those who are in mourning for the Mother they lost. For those who had children but feel like it all got messed up even though you tried your very best. And Mothers who are mentally ill. What a HUGE extra challenge. And to my children wherever they may roam, I love you more than you could ever imagine. Co-consciousness for a person with Dissociative Identity Disorder (DID) is the ability to share space with an identity plus the main personality (host). It is not an attempt to integrate another part, it is an attempt to work alongside them. For so many years I heard voices but I did not know what they were, who they were or what the heck was wrong with me so I attempted to ignore them all no matter how loud or insistent they got. When you’ve never known a different life, you can also misconstrue the meanings of certain statements and assume that others are in fact just like you. I thought when people said they had thoughts running around in their heads or that they could not sleep with all the issues on their minds, I assumed they heard voices too. Eventually I realized the difference but that did not help me to understand, it just served to make me feel insane. I was in hospital (2013) before I was finally told what those voices were and I was so confused about how to speak to them. My nurse suggested I just try talking to them which sounded insane to me after actively avoiding them for 40 years… but I tried. Well HOLY CRAP BATMAN! They heard me and spoke back to me. At the time only one voice rose above the rest as distinct and seemingly always present. That turned out to be whom I called Julie but whose real name was Reilyn. Reilyn was the only Helper that I was ever co-conscious with. I knew she was there and she always knew what I was doing. She knew what everyone in the system was doing. I affectionately called her “the gate-keeper”. Over the course of the first year I realized that I had some power over when Helpers came out and very gradually lessened the amount of time where they were in charge. I doubt I will ever completely master it because I do not have enough energy to constantly be “on guard” every moment but I was able to make a few deals, put some rules in place, and create a less chaotic life for myself. I am at the point now where I am trying to work on becoming co-conscious with other Helpers. A few are thrilled and join me happily but most are hard to reach. It will take me years of hard work to get it all worked out but I feel they are all worth it. Hannah (Hannah-banana) is one of the very special “Littles” that likes to come out now. It took her a long time to understand that I am an adult now and that I can keep her safe. Once she realized that, she began to come out to share time with me. This where I struggle though. Being co-conscious sounds great but when you have a 3-year-old and a 46-year-old in the mind at the same moment, we swing from wanting to curl up in a little ball, hide or run away to a 46-year-old willing to offer protection. We can go from wanting to eat nothing but cookies for supper to understanding that cookies are only for treats. We walk through Wal-Mart and suddenly want a hippo (which she eventually got) while trying to fill an adult shopping list that doesn’t interest a young child AT ALL. The same can be true no matter what the age of the Helper that I am trying to become co-conscious with. It is not just a matter of sharing some time. It is trying to adequately care for more than one set of needs at a time and it can be confusing. One of the older men who has decided to share time (co-consciousness) with me is Oscar. If you recall Oscar the grouch? That is how Oscar sees himself and it is the reason he has that name so it seems. Being co-conscious with Oscar so far is better done while at home ALONE. I can not for a moment pretend that I do not swear (I do) but not harshly or directed at others. When we share time, I will be thinking about someone with kindness and Oscar is there saying “Oh just f*** off! Go away! I hate you! Brat! Idiot!…”. He is not very nice but I know he is that way for a reason and he needs to be heard too. That gruff manner is his way of creating distance between himself and the potential of being hurt.